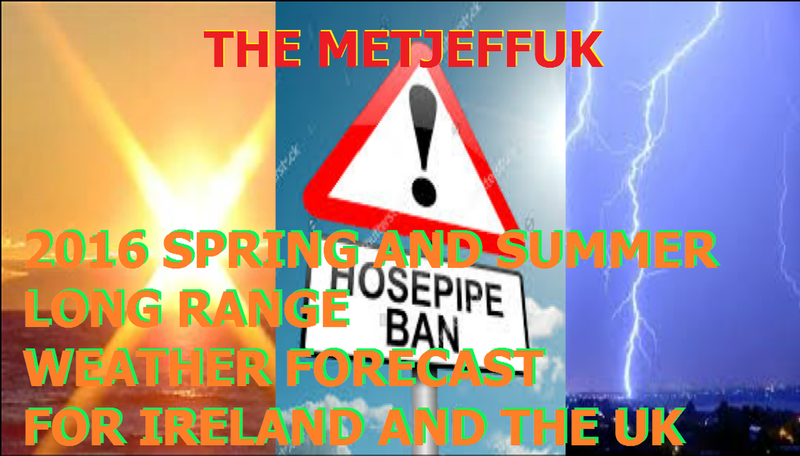 Here at metjeffuk.com we like to give the long range forecast in the most plain and simple way possible easy talking straight to the point forecasting without the waffle. But if you want the science behind it I will be doing one especially for you very soon. The summer of 2016 could it be the hottest for 40years? My forecast is based on many factors coming in to place which I will not in to detail here, but the most significate will be the slow cooling of the eastern pacific, if this happens (and my forecast is based on this) it usually allows high than normal heights to build over the UK with the air coming off the an hot continuant It’s the recipe for a dryer and hotter summer. This month will start off cold and wintry with snow showers or longer periods of snow over high ground mostly in the north, will also be very windy at times too as we go to the end of the month I expecting high than normal heights over Scandinavia with a cold easterly feed coming from Siberia so a very cold end to March with the possibility of significate snow in places. After a cold and unsettled start to the month it looks high pressure will build over the country settling things down with spring like days but hard frosts at night. Towards to end of the month I am expecting it to more unsettled with rain or drizzle at times. So May starts unsettled with rain followed by wintry showers giving snow over Scottish mountains but high pressure will build from the south giving a mostly fine end the month. I’m forecasting a warmer than normal summer about +2C above the CET Temperature with an average temperature this summer of 18c/64F +2c above the average CET (2001–2008) of 16.3C with extremes of 35c/95F at times throughout the summer. Unsettled still over Scotland and the north of England and Ireland but high building again with more of a southerly wind and temperatures rising, with this expect thunderstorms to drift up from France with some these severe with local flooding possible. Somewhat cooler start to the month but the Azores high moving in-so dry and sunny mid-month and very warm or hot temps could get up to 38C/ 100F and these conditions lasting to the end of the month when we could quite possibly see a hose pipe ban! So there you have it the summer of 2016 the hottest for 40years! We are updating the forecast over the coming month’s thanks for taking the time to read my predictions.